Above and left: Taylor Mesa, June 26, 2015. 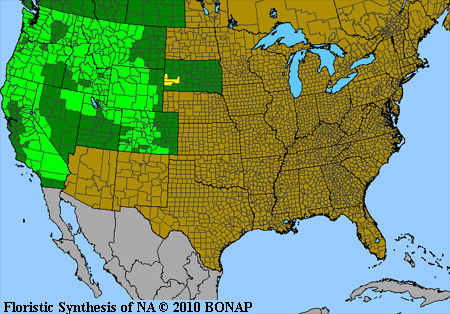 Pinus contorta is, as the map below indicates, found only in Colorado in the Four Corners region and it was introduced in this area and is uncommon. 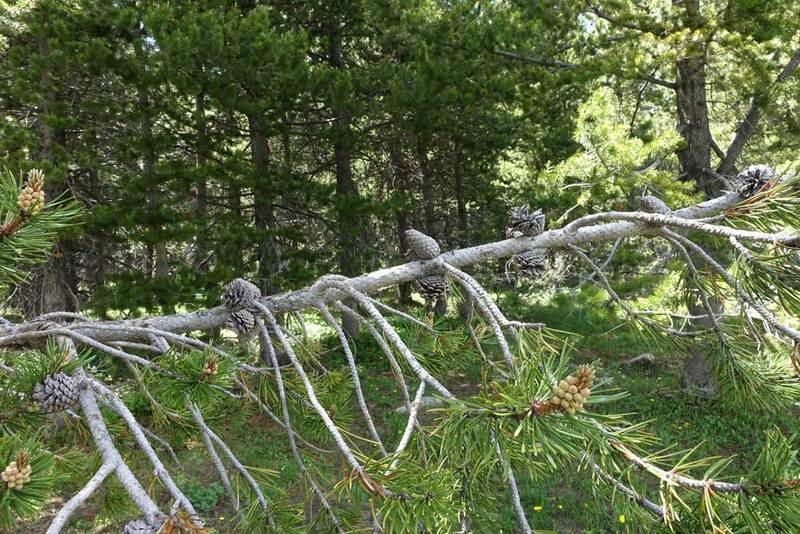 In those areas where Pinus contorta does occur, it can occur in dense stands. Notice in the photographs above and at left that there is little shrub undergrowth. 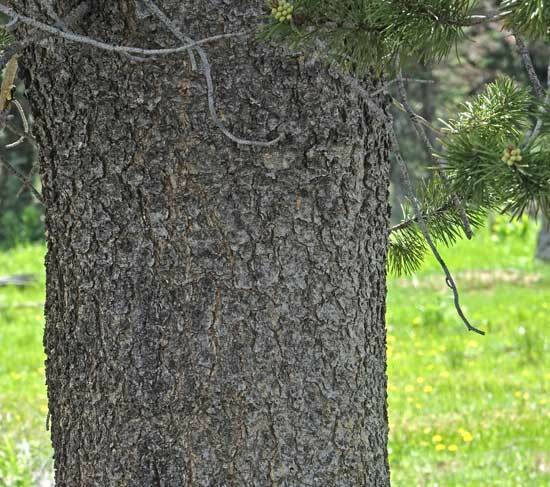 This heavy shade is the reason these trees were introduced in the western San Juans. 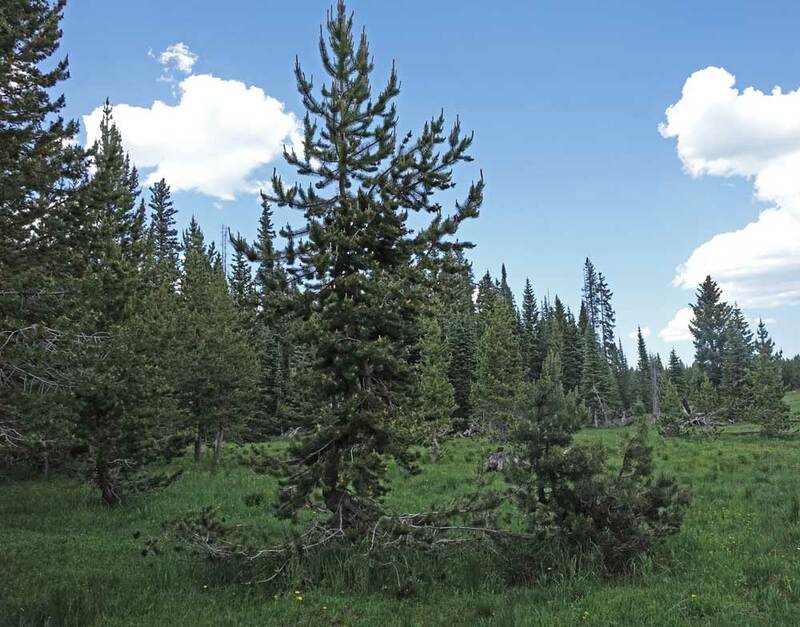 It was thought, according to Phil Kemp (who used to be the Forester for the Dolores District of the San Juan National Forest), that after the area was logged, the desired Picea engelmannii would sprout in the shade of the introduced Pinus contorta. That did not happen. 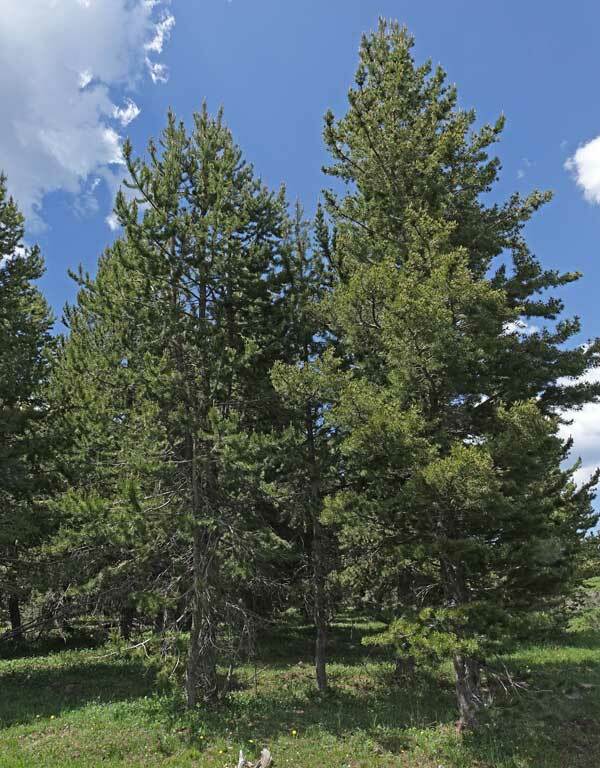 The tallest trees pictured are about seventy years old and the young trees are about fifteen. in the mid-1820s David Douglas was the first to identify this tree for science from specimens he found "in swampy ground near the sea coast, and abundantly near Cape Disappointment, Washington and Cape Lookout, Oregon". (Intermountain Flora quotation.) 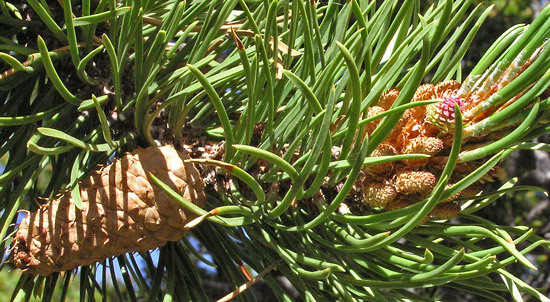 Douglas named the species and George Engelmann named the variety that is found in Colorado: Pinus contorta variety latifolia. "Con torta" is Latin for "with a twist", perhaps given by Douglas because the variety that grows near the sea coast (P. contorta var. contorta) has trunk and/or leaf twists. Andrews Lake, July 2, 2007. 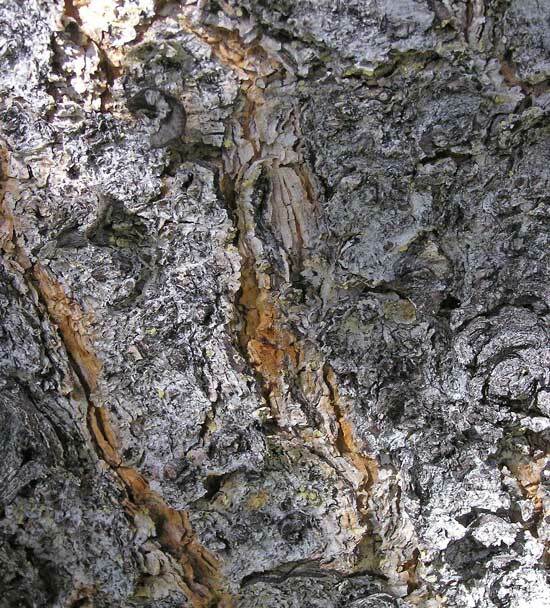 The scaly bark of Lodgepole Pine varies from gray to orange brown and can fracture exposing an orange layer beneath the light gray. Taylor Mesa, June 26, 2015 and July 7, 2010 and Andrews Lake, July 2, 2007. 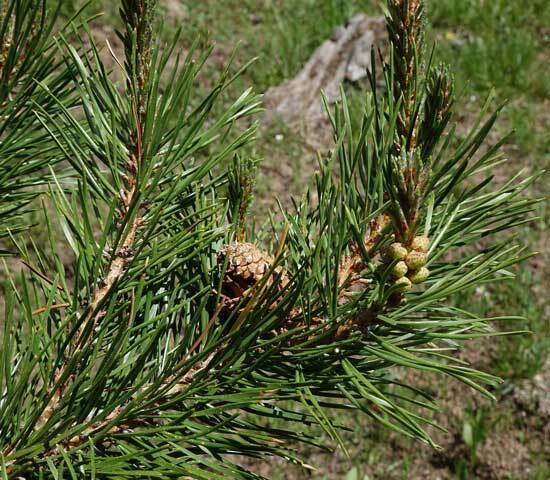 Bristle-tipped cones (yellow/orange in youth, light gray in future years) remain on the tree for a number of years. (Also see the second photograph at the top of this page.) 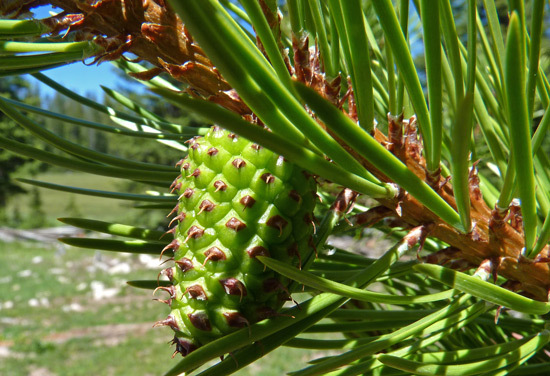 Some cones open only in fires to disperse their seeds. The small, flaky-looking buff-colored cylindrical structures to the right of the cone in the first two photographs at left are the male, pollen-bearing flowers. The day I took the second photograph at Andrews Lake, winds were releasing clouds of pollen from the male flower.